Oh so many things to play with! In our last post we talked about open-ended toys. About what they (don’t) do and what they facilitate. Many of you have then asked what exactly those toys could be for certain age groups. A while back we had a post about what our boys loved to play with when they were babies. So we thought we’d now share a short list of toys for kids from 6 months up, mainly focusing on the fact that the children are mobile, crawling and walking, and therefore able to follow the toys around. 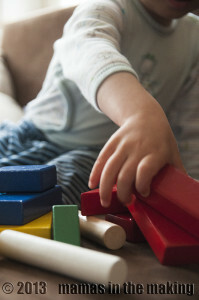 The age span is huge, so first and foremost make sure that the toy is safe for the age you are interested in – for example, if it’s a child just over 6 months they are still learning the world by putting objects in their mouth, so anything made of paper or too small might not be a good idea. 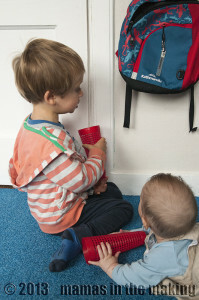 The main thing is that once they are safe to use, they stay with the child for… well, we’re not sure for how long. For ever perhaps? We still have all the stuff our boys used when they were tiny – except now they are getting a new life in pretend and fantasy play! 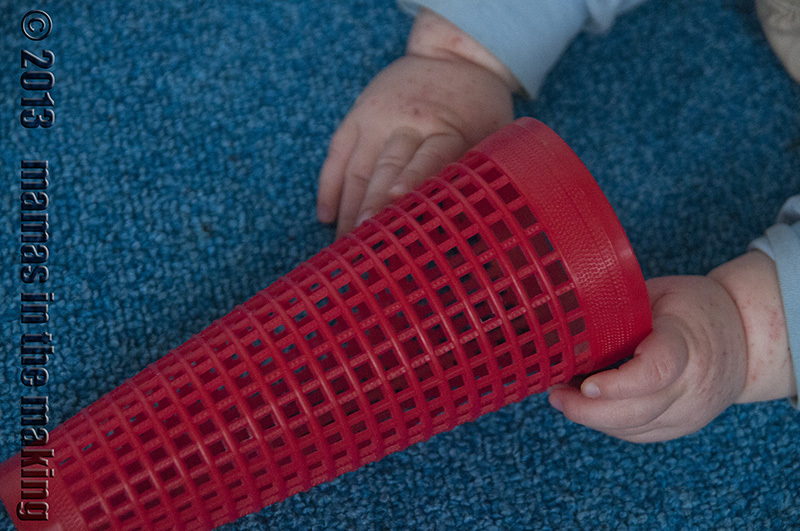 Since we look at play as ‘the highest form of research’ (Einstein) as well as an innate urge, we give ideas what schemas a child might be working on using these objects. You will surely notice how many areas of development they engage, and that these ‘toys’ tend to provide play experience for all senses. The list here is intended as a collection of ideas ☺ and it is not exhaustive – so if you have more please share with us! Pieces of fabric, scarves etc. Cardboard boxes rule the world in this department, but there are others as well – any container that is safe is good for it. Surely you have them lying around, after all so much food these days comes in containers of some kind. It doesn’t matter big or small. If only a small bottle cap fits in it or if the child itself can hide inside. This is about sensory processing “What fits in where”(containing schema). Big and small. Filling and emptying. But most importantly: endless fun. Can be carried around like Mom and Dad do when they go to work or shopping. They can be filled with exciting stuff. Then emptied. They can be worn (on your head?) (transporting schema; containing schema). They can… BE A LOT ! Things you might be inclined to throw away… but don’t! Don’t throw these out ☺ You can collect them and have a box ready for pretend play, for building, for artsy activities. For looking through. 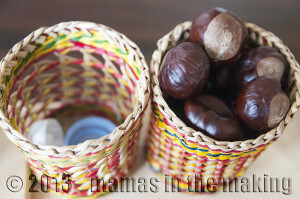 For taping on the wall and weaving ribbons through them, or dropping beads or chestnuts and checking how loudly they fall out onto the floor. Pretend play. Fantasy play. Clothes for teddies and dolls. Good for putting other things into. Ahh, again the joy of putting into and taing out of can be explored endlessly with these. Pots and pans, of course! For collecting, piling, counting, lining up. For cooking and throwing. To give them names and play house. You can have your very own sandbox in a small box! Ute Strub, a physiotherapist who collaborates closely with the Pikler Institute in Budapest uses sand for incredibly creative sensory play. She provides all kinds of kitchen utensils (spoons, sieves, colanders etc.) 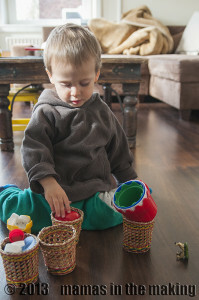 and sand in boxes and baskets – not only kids have fun, believe us! A lovely post about nature’s toys can be found here. Balls of all sizes. Many of those. In fact – at this stage you might want to have A LOT of everything. We humans are collectors by nature. We like to gather a nice amount of things around us. So children do that too. Well we had a whole post about cars and what they allow. Our boys are now 3,5 years old. Cars are still the favourites. 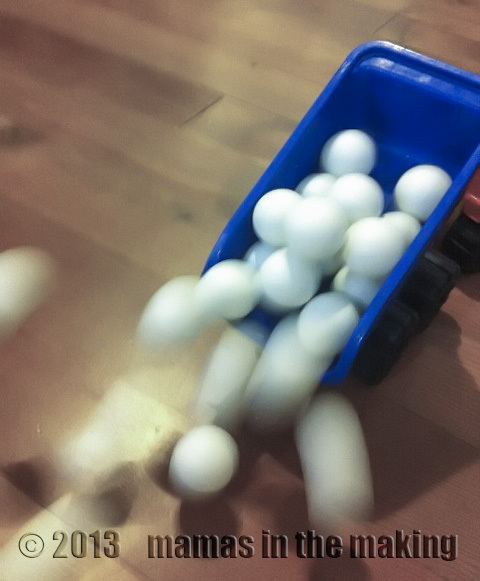 No matter if it is a duck or a truck – when before a child can walk he will be busy pushing everything that isn’t screwed to the floor, he will then be happy to have something to drag along once he can walk freely. None of these examples have a label like “fine motor skills“, “hand-eye-coordination“, “language developments“ etc. Because they all encourage those skills without being made for one or the other. They simply are. And with every child they become something new. They open a whole new world every day. What are your child’s favourite open-ended toys? How does he play with them? Tell us your play story, or maybe send us a photo of your child playing with his favourites!